But despite our certainty that action of some kind is required, we recognize that the climate destabilization issue includes a good deal of uncertainty--and some controversy. We plan to look at both sides of the debate as we search for a fuller understanding of the issue, for as John Stuart Mill points out in his classic essay On Liberty, “since the general or prevailing opinion on any subject is rarely or never the whole truth, it is only by the collision of adverse opinions that the remainder of the truth has any chance of being supplied.” That is why we’ll be researching--and inviting input from--the climate “skeptics” on our site. Even though we’ve already come to certain conclusions, we are aware that life in this universe is a constant learning process, and we welcome every point of view that may add to our search for solutions. As we continue to learn about this issue (and share that learning with you through this blog) we will approach the problem from a multidisciplinary, universe-scaled evolutionary systems perspective, applying our knowledge of the Universe Evolutionary Principles and the new Universe Evolutionary Worldview at points along the way. We invite comments from anyone whose approach or opinion is based on a sincere desire to contribute to our mission with their particular version of the truth. We’re looking forward to making this site a forum for collaborative learning. We’d love for you to join us on this journey! Please feel encouraged to share your comments and to subscribe via RSS in order to join the journey. *** Thank you to the NASA Goddard Space Flight Center, whose flickr photostream provided the above image. It beautifully illustrates how much we have learned about the universe in which we live. 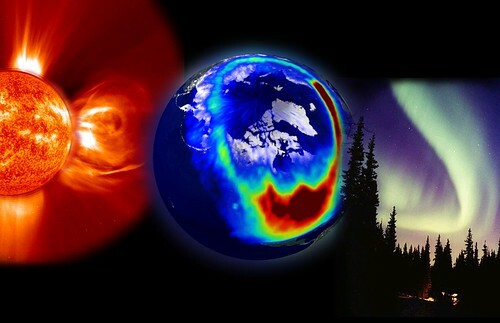 This is a composite image of a coronal mass ejection on the sun and the aurora it produces on earth--seen from space and from the earth itself.